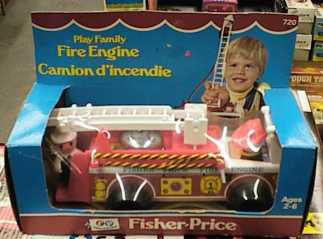 Description: The Play Family Fire Engine set includes a wooden fire engine and an Original Little People fireman. The fire engine has a permanently attached fireman driver with a head that bounces excitedly as the engine rolls. The engine has a bell on the back that rings as the engine rolls. The fire engine also has a pivoting plastic ladder on the back, and a 12" long red and yellow shoestring fire hose. The fire engine has 2 main variations: it comes with either a white plastic top and back with a red ladder, or a red plastic top and back with a white ladder. A few variations also exist among the fireman. The oldest fire engine sets were sold with a rare wooden fireman that does not have a collar around his neck. FPT536 - Fire Engine with RED front grill and ladder base, WOODEN driver's head. FPT758 - Red BASE piece to the FPT536 & FPT761 firetruck. Has two round pegs at one end that attaches to swivel mechanism on truck. Has 10 rungs. Extension piece (FPT759) fits into this piece to make a complete ladder assembly. FPT759 - Red EXTENSION piece to the FPT536 & FPT761 firetruck. Has 2 "hooks" at one end that holds ladder onto base piece. Has 9 rungs. Base piece (FPT758) accepts this piece to make a complete ladder assembly. KWW - Short black fireman with a He is smiling with freckles, "" eyebrows, and wearing a white fireman's helmet. He has 2 red plastic arms without a collar behind his neck. FPT535 - Fire Engine with WHITE front grill and ladder base, WOODEN driver's head. FPT756 - White BASE piece to the FPT535 & FPT760 firetruck. Has two round pegs at one end that attaches to swivel mechanism on truck. Has 10 rungs. Extension piece (FPT757) fits into this piece to make a complete ladder assembly. FPT757 - White EXTENSION piece to the FPT535 & FPT760 firetruck. Has 2 "hooks" at one end that holds ladder onto base piece. Has 9 rungs. Base piece (FPT756) accepts this piece to make a complete ladder assembly. PDWW - Short black fireman with a wood body and a wood head. He is smiling with freckles, "" eyebrows, and wearing a white fireman's helmet. He has 2 white plastic arms without a collar behind his neck. LWP or LPP - Short black fireman. He is smiling with freckles, "" eyebrows, and wearing a white fireman's helmet. He has white plastic arms with a collar behind his neck. FPT761 - Fire Engine with RED front grill and ladder base, PLASTIC driver's head. LCPP - Short black fireman. He is smiling with freckles, "" eyebrows, and wearing a white fireman's helmet. He has red plastic arms with a collar behind his neck. FPT760 - Fire Engine with WHITE front grill and ladder base, PLASTIC driver's head. This set was sold in a 8-3/4" long, 3-1/4" high, and 3-1/4" wide display box. This fire engine was also used in 1987-1988's #2250 Fire Engine set. The #2250 was not sold with a Little People firemen, but with a Little Golden book titled, "Fire Engines". The fire engine used in the #2250 is marked #720. Also see 1959-1962's #630 Fire Truck for a Fire Truck with a permenantly attached driver figure.